These knives feature 1095 steel and black texture powder coated blades. 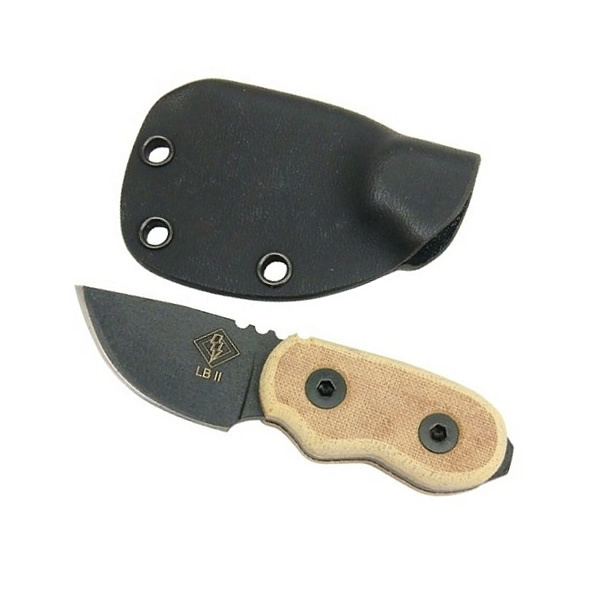 Comes with standard black custom molded Kydex® sheath with para-cord neck lanyard. Edge Type Lock Type fixed Deployment Mechanism Pocket Clip Configurations Hardness 53-55HRC Overall Length 4.25 in (11 cm) Closed Length Weight 3.8 oz (.11 kg) Blade Length 1.8 in (4.6 cm) Blade Material 1095 Carbon Steel Blade Grind Blade Angle Blade Thickness .16 in (0.4 cm) Blade Color Blade Finish Powder Coat Blade Stamp Handle Color Handle Material Micarta Handle Thickness Sheath Type Sheath Color Sheath Material Kydex Packaging Type Packaged Dimensions Shipping Weight Release Date Country of Origin U.S.A.